Effects of Social Media on Your Business | Orange County SEO Company, Inc.
Social media use is one of the biggest considerations in launching your new SEO campaign. If you have not used social media before, you are in for a pleasant surprise at how easy it can be to use and how much it boosts your overall website traffic and, ultimately, your business bottom line. On the other hand, there are rules for using social media that you must follow to get the maximum benefit from these platforms. Many business owners, having used Facebook or Twitter personally, think they can simply create a page for their business and use the same techniques they use when chatting with friends to be successful with social media. This is not really true. The mindset behind the use of social media for businesses is somewhat different than when you use these platforms purely for social reasons. Therefore, it is crucial that you have good advice as you attempt to enter the social media world to build your business following. Here is a great infographicfor considering content development and how it affects your social networking strategies. While many people believe content is the most important factor in search engine optimization, few stop to think that it is also the primary driver in social media, as well. 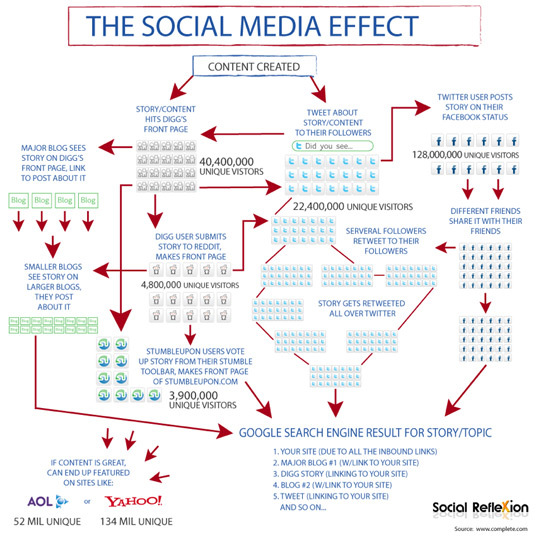 This flowchart-style visual helps you to understand how content affects your social media following and ultimately your organic search rankings. As you can see, social media marketing is not as simple as it first appears! Content is key, and writing good social media content that boosts your rankings and attracts followers is a process that is best handled by those who understand how to create it. You may also have noticed that sharing among followers is a key point to consider in any social media campaign. This is because followers are the link between you and all the people in the world you do not know. You may have played a game at one time or another linking a famous person to another person in six degrees of relationship. It is amazing how many times you can link someone to someone else in as few as six steps! Social media has the same power—you will be amazed at how many of your followers link you to other people and how wide you cast your net with the right social media techniques. However, these techniques depend on using the right strategies to get your followers to share your posts—and that goes back to content. As you work with social media, you begin to see how important content really is in the greater scheme of reaching the world with your message. To put it simply: good content drives users to share and quickly extends your reach into areas of which you are not even aware. Poor content has the opposite effect and keeps you isolated and alone in the social media world. Call Orange County SEO today to learn how you can use the power of great content to boost your internet presence and build your business.